A feature-rich, cloud-enabled ERP platform for SMBs that’s mobile-friendly and gives you a real-time view of your business anywhere at any time. Small- and medium-sized businesses need flexible, scalable and mobile-friendly tools that connect people with data. Acumatica’s Cloud ERP links all key business functions for efficient operations, informed decisions and high-impact results. Inventory Control. Knowing what’s on hand, where it is and what needs to be ordered is a constantly shifting target. With Cloud ERP, purchasing, receiving and issuing are automated, using built-in workflows. Reduce costs and have a true understanding of the value of your inventory anywhere at any time. Improve Cash Flow. Great service results in better cash flow. Cloud ERP ensures employees take accurate orders, ship items promptly and prevent billing mistakes. Improve invoicing by using the ERP to manage contracts, terms and conditions, and schedule billing. Dashboards can monitor slow payers and address payment issues early. Serve Customers. Your entire team has a 360-degree view of the customers, with access to all interactions, notes and discussions. Address issues, connect departments and deliver higher satisfaction scores. Boost Productivity. Use business intelligence tools and dashboards that connect data from many sources to deliver insights, make smarter decisions and refine the way work is done. Intelligent technology that’s scalable to meet the needs of your growing small- or medium-sized business, Acumatica’s Cloud ERP gets your business connected. With Acumatica, you share data across departments through suites covering finance, manufacturing, project accounting, distribution and customer management. Get control of your information and make decisions faster with interconnected tools that replace stand-alone systems. You’ll see more collaboration and efficiency as your teams – from sales to customer service – get on the same page with centralized information accessible from any device. As your company grows, Acumatica scales up, allowing you to expand seamlessly, without the need to bring in new technology. 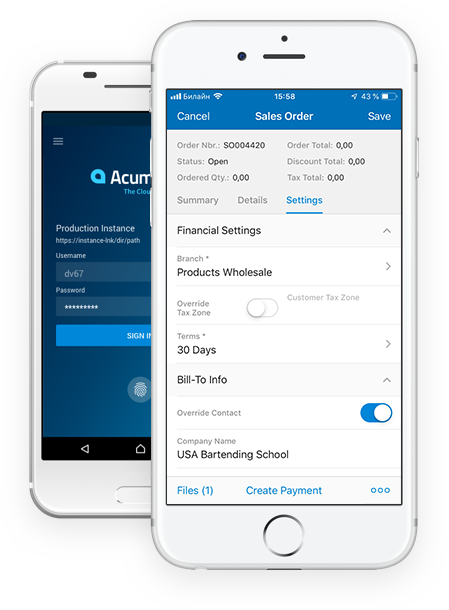 Acumatica is the fastest-growing ERP serving clients in service industries, retail, e-commerce, distribution, manufacturing, construction and technology and many more. Deploy Acumatica on the cloud and give your company speed, reliability and security. Hosted on Amazon Web Services (AWS), users can access all the functionality via a web browser, either desktop or mobile. When you choose the cloud, Acumatica sets up and configures your ERP. You won’t have to manage and maintain in-house hardware or software. With Acumatica SaaS you gain added benefits, many automated, including data backup services, 24/7 access, software updates, application maintenance, and high availability rates. Acumatica SaaS lets you customize fields and track multiple companies in a centralized database. Plus, Acumatica manages resources so your system performance is lighting fast and built for consistent traffic—even on Black Friday. Are you looking to migrate from legacy systems, another ERP to Acumatica? Exceptional Software Solutions will guide you through the migration process from start to finish. Our engineers and consultants will help map your data, refine processes and clean up duplicate information to create a smooth and seamless transition to Acumatica. A Course Catalog with intuitive text and video course for employees working in customer management, finance, order and inventory management, project accounting, programming or system administration. Learning Paths with suggested courses for different departmental roles and for those that need to create reports, manage web services or repair and support technology. Job Aids that are role-specific and offer detailed descriptions of how to enter data, build functions and get the job done. Quick Guides that deliver step-by-step instructions for tasks of all kinds, from reconciling bank statements to configuring user security settings. Learn more about Acumatica in our resource library.